La Nova Singers are all students of Michelle. Students who reach a high vocal standard are invited to become a member of the ensemble. 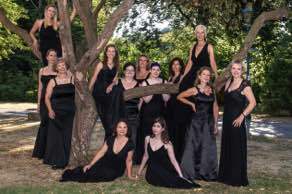 La Nova Singers are a well established, highly acclaimed female ensemble and are recognised for their vocal beauty, harmonies and ethereal qualities produced by the discipline of the Bel Canto technique. Their repertoire includes Sacred, Baroque, Opera and Operetta, Classical, G&S, Musicals and Popular Light music and sing in Italian, Latin, German, French and English. As well as giving regular concerts throughout the year, they have engagements for weddings, dinners, anniversaries, lunchtime concerts, charity and corporate events. Performances from the group can be heard on YouTube. La Nova Singers formed in 2004. Several of them are soloists and semi-professional singers in their own right and all singers study at La Nova Studios. A Sparkling Evening with La Nova Singers - 11th December 2013. "La Nova Singers are most certainly one of the best - if not THE best - choral groups around and their sparkle and professionalism shines through from beginning to end. It was a privilege to hear them and to be part of their audience." Linda Kirkman - Scene One.